The curve above represents our power generation for February 26, 2012 from 6am to 5pm. 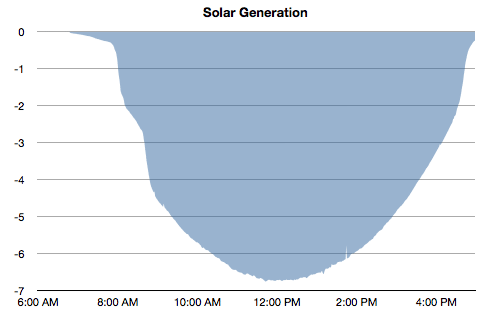 It is the first fully cloudless day since I’ve been monitoring our energy usage and solar generation. Note that TED tracks solar generation values negative and usage/load values positive. It’s nice to see the power generation capability when there are no clouds for an entire day. The two dips in the morning represent two clusters of pine trees low in the morning sky. When we started this project, we knew we were going against the prevailing wisdom, it’s one of the reasons we call this the uphill house. We always seem to be pushing things uphill when they naturally want to go the path of least resistance. 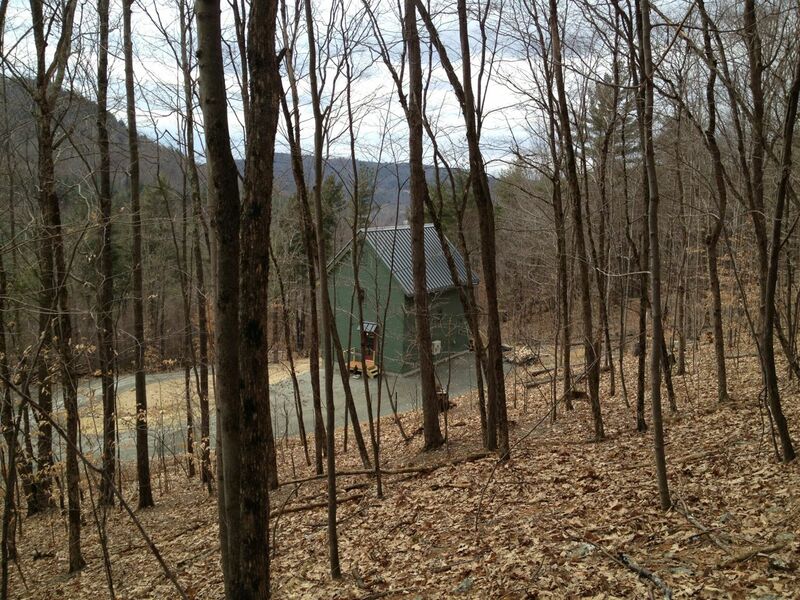 First we decided to build a house on the side of hill. Not the easiest or cheapest option, but the view is spectacular and we have great access to the sun. Then we decided to build a super tight, super insulated house in an area that has no skills building this way, but we did it anyway and were quite successful. Finally, we decided to build a smaller house so we could spend our money on quality materials, systems and appliances. All these things make a beautiful, long lasting, extremely comfortable and efficient home, but unfortunately don’t appraise well. We recently had our home and property appraised as we seek to roll over our construction loan into a mortgage. Make sure there’s something soft under your jaw… the appraisal came in at roughly 65% of the total value we’ve put into the land, house, driveway, septic and well… and that doesn’t even include our own sweat equity. As we see it, home appraisals are good at valuing similar things, apples to apples, but fail when comparing Apples to PCs. We are quite happy to pay a premium for Apple products because we understand and appreciate the value. If you don’t understand the value, then an iPad clearly looks more expensive than it’s worth when compared to other tablets. If you’re only means of comparison is square footage and number of beds and baths, then our house looks more expensive than it’s worth in comparison to other homes. The end result is that we do not qualify for a standard loan from Freddie Mac. Thankfully we are working with a great local bank that sees the value and is willing to take the loan onto their balance sheet. However, to protect themselves from the extra risk of not being able to resell the loan to Freddie Mac, they are offering the loan at a higher interest rate. And this is what leaves us feeling blue. Building green and choosing quality over quantity is considered more risky than a standard home built using standard practices. Performance for our first month in the house. Updated Feb 5. * 504 net usage + 369 generated = 873 kWh of total energy consumed. I goofed up earlier because I forgot the utility meter reading is a net value, not a supply value. Originally I subtracted the two values and got into a mess. Thanks Walter for spotting my error. This should be easier now that I have TED up and running. Unfortunately the mild winter weather is making it difficult to assess performance for an average year. New York State publishes Heating Degree Day Information, that documents the number of Heating Degree Days per month and compares them to the previous year and 30 year average. Albany’s 30 year average is 1085 HDD for December. December 2011 recorded 955 HDD, roughly 12% lower (warmer). December 2010 was higher with 1206 HDD. I’m expecting January 2012 to also have an unusually low number of HDD. We now have monitoring equipment in place to more accurately measure kWh usage, PV generation and indoor and outdoor temperatures and humidity readings. Looking forward to seeing how February measures up.